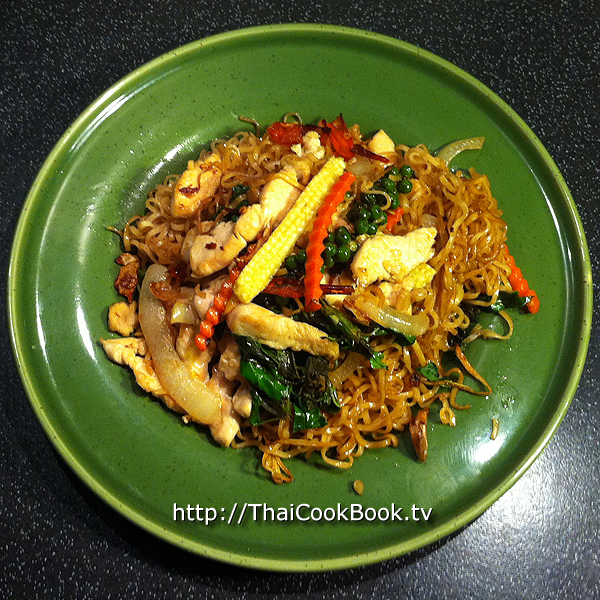 Drunken noodles, or Pad Kee Mao is a spicy stir-fried Thai noodle dish. The Thai words Kee Mao (ขี้เมา) mean drunkard. Several popular theories exist for the naming of the dish. One of the most common comes from the idea that you would come home late after a night of drinking and cook something with whatever was left in the frig, another says that these noodles are so spicy that you need to drink a lot of beer to get them down, so you get very drunk at dinner. Either way, I guess they should be called "drunkard's noodles" in English, but Drunken Noodles is what everyone still calls them. This recipe uses instant ramen-style noodles in place of the traditional wide rice noodles. What's in our Stir-fried Spicy Ramen Noodles. How we make our Stir-fried Spicy Ramen Noodles. 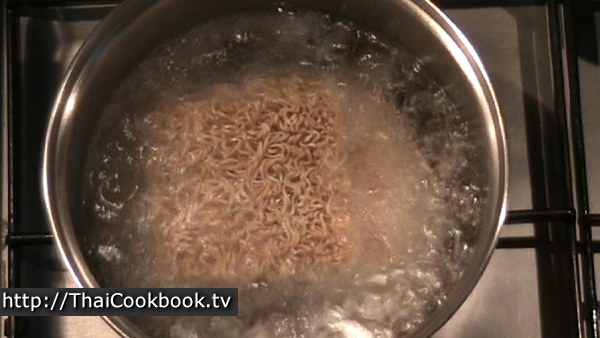 1) Boil the instant noodles for about a minute, no more. Drain well. 2) Crush chilies and garlic. Heat oil in a wok or deep frying pan until it gets really hot. Add the garlic, chili, and onion, and stir and cook for about 10 seconds. 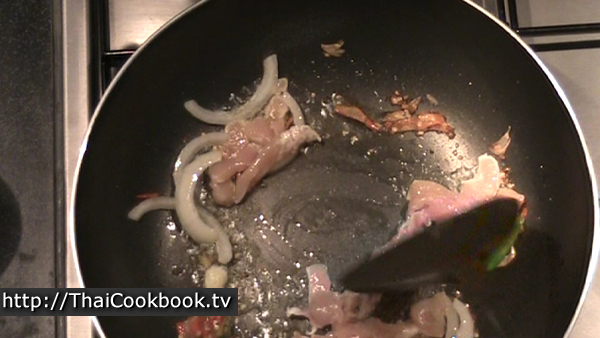 3) Add the sliced chicken, and cook for about 30 seconds or so, until it is cooked about halfway. 4) Add baby corn, sweet chili, carrot, finger root, and green peppercorn bunch. Stir it all well, letting it cook for 30 seconds. 5) Add the light soy sauce and oyster sauce. Keep stirring and let it get hot again, then add the sugar and fry until the sugar is all melted in. 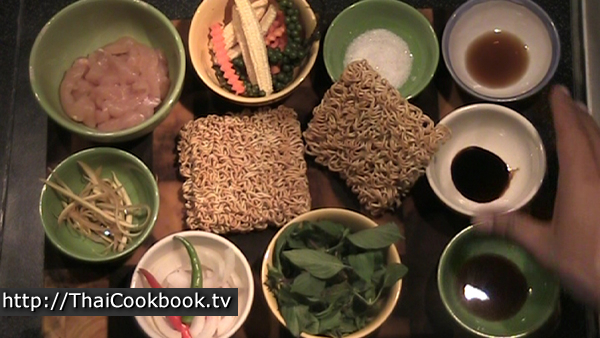 6) Add the cooked instant noodles and stir them into the sauces and vegetables. 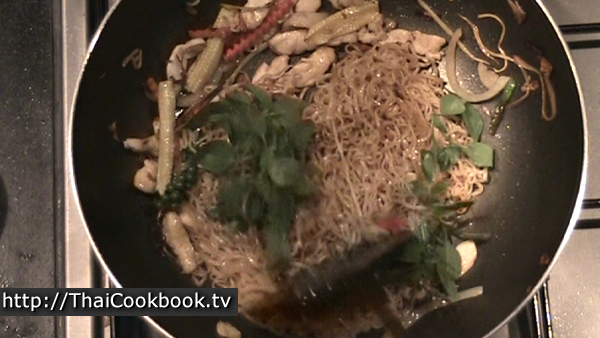 7) Next, add the dark sweet soy sauce to the noodles and stir up well. Turn off the heat and add the fresh basil. Stir well and serve. Organize and assemble the ingredients. Slice chicken breast (or pork tenderloin, if preferred) into thin slices. Clean, wash, and cut the vegetables and basil. Put about one quart of water on to boil (for cooking the instant noodles). 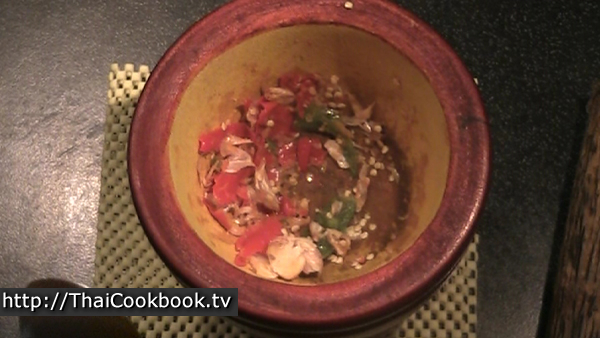 Using a mortar and pestle, pound and break up the chilies and garlic cloves. If you don't like your food really spicy, use less chili or a mild chili. Boil the instant noodles for about a minute, no more. You want the noodles to still be very firm. Remove form the heat, and rinse them under cold water to stop the cooking. Your noodles should still be a little stiff after they are cooled. 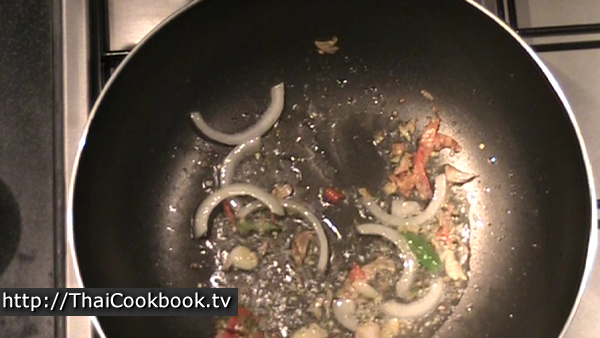 Heat 2 Tablespoons of vegetable oil in a wok or deep frying pan until it gets really hot. Add the garlic, chili, and onion, and stir and cook for about 10 seconds or so until the garlic start to smell delicious. Be careful not to burn it, so check the heat and reduce the flame as needed. Add the sliced chicken, and cook for about 30 seconds or so, until it is cooked about halfway. Add the baby corn, sweet chili, carrot, finger root, and green peppercorn bunch. 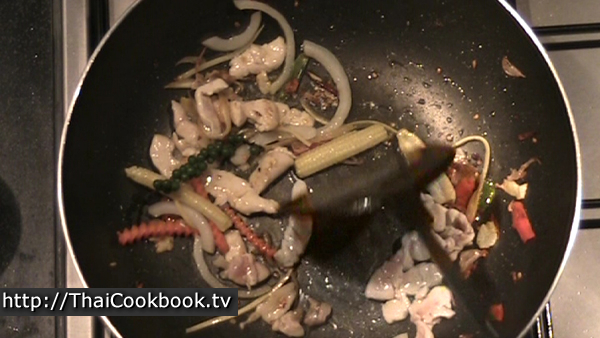 Stir it all well, letting it cook for 30 seconds, then add the light soy sauce and oyster sauce. Keep stirring and let it get hot again, then add the sugar and fry until the sugar is all melted in. Add the cooked instant noodles and stir them into the sauces and vegetables as much as possible. Keep flipping and turning them for about 1 minutes. 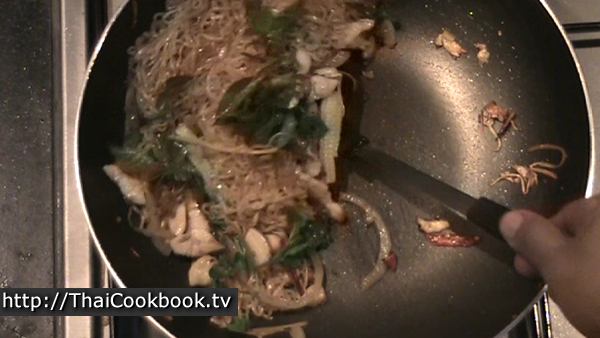 Push the noodles down into the pan so they are frying well. Next, add the dark sweet soy sauce to the noodles. 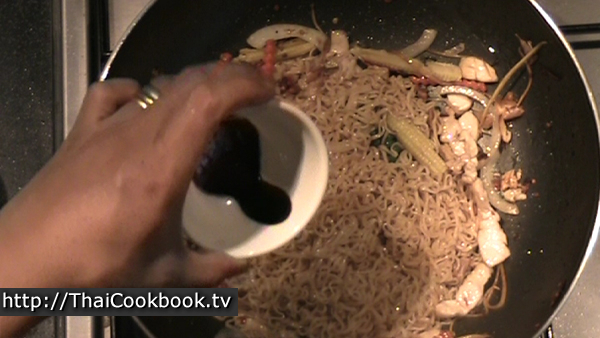 Stir it in well, pushing and pulling the noodles so you distribute the sauce evenly on everything. Add the fresh basil, reserving a couple of nice flower tops to use as a garnish. Stir it all up and let the basil soften. It just take about a minute or less. 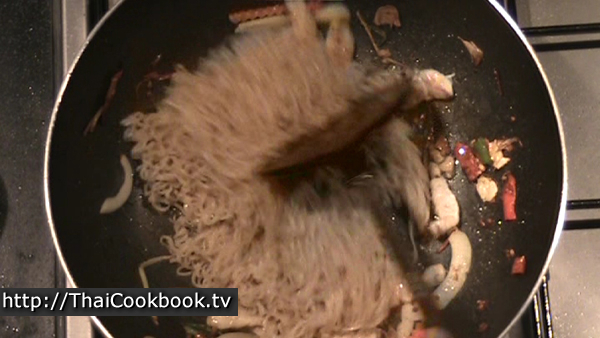 The noodles should be just a little brown, and most of the sauce will be absorbed. It's ready. Don't overcook it. Plate and serve right away. 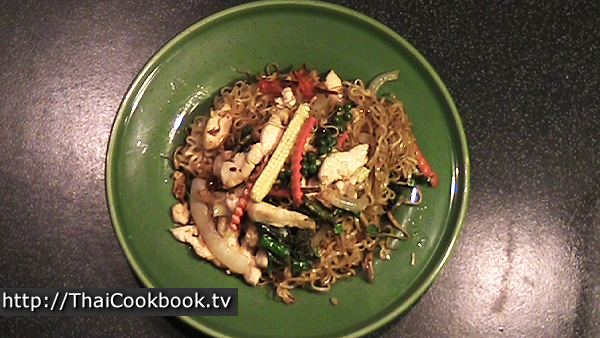 Arrange the noodles on the bottom, with the vegetables mostly on top. Pull out the peppercorn bunch and use it as a garnish, along with a little fresh basil tops if you have some. Note: As I said earlier, this recipe uses instant noodles in place of the fresh, wide and flat rice noodles (Sen Yai, kway teow, เส้นใหญ่) that are called for in the traditional recipe. If you have a source for the fresh noodles, I highly recommend making that version. This one is delicious, but I just never can get enough of those chewy, sticky, fresh, wide rice noodles.